Last Friday on his radio program, Glenn Beck declared himself to be a radical revolutionary. It was recorded by Media Matters. Take a listen. Beck conveys two false ideas, 1) that President Obama is a "revolutionary" and 2) that Glenn Beck is radical revolutionary. If Obama is such a radical or revolutionary, as Beck claims, why are progressives so disappointed in him (as Beck himself showed on his magnetic chalk board last week)? Progressive academic, David Michael Green, is the author of The Regressive Antidote. Green's views of the Administration have been used in the past to demonstrate the absurdity of Beck's claims about President Obama, and the following comes from his article, "The do-nothing 44th President." Pardon the uncontrollable line spacing from blogger. 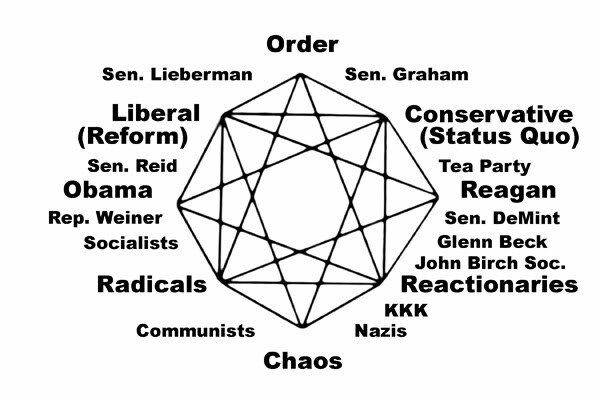 Refuting Beck's claims continues with another look at the mandala of political taxonomy (ordering) below. Beck makes this claim not only because he has had virtually no post secondary education but also, to be fair, because highly educated reporters and pundits often refer to reactionaries as "radicals." He doesn't understand basic political theory. 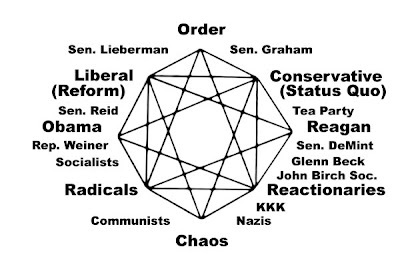 As displayed on the mandala below, Glenn Beck is a regressive reactionary. He's not even a counter-revolutionary because there's been no revolution. His side lost the last election, and Beck refuses to accept the will of the American people. Beck or anyone else at Fox "News" probably will not cover this, but he needs to stop inciting violence with his deceitful fear-mongering, yellow propaganda and mean-spirited and ignorant hyperbole. He needs to, but he most likely will not. Beck cannot - by definition - be or become a "radical revolutionary." If this "revolution" that Beck is sparking continues, he could end up imprisoned and rightly so. Victor, I like how you used Sarah Palin's new fake word, "Refudiate." Was this done on purpose? No. The word was used on another blog, and I didn't realize that it was used as a way to mock someone. I have changed the word to conform to the English language. I remember listening to Beck recently and he was talking about how much the "left" needs a riot in the streets to begin some radical takeover. The next day he was talking about how he was perplexed about something and very irate and he questioned why his "people" were not in the streets. How Ironic...who wants the riot? Beck or Beck? Finally clicked over to the new host to see what's new. How's Blogger treating you thus far? You are right! Beck is not the most credible person and is an 'Entertainer' - making millions and delivering exactly what a sector of the public wants to hear. But, I am also right! Beck is right with many of his general points - which is scary! You can pick apart a number of his specific details and words, but you cannot refute that the current Administration has a dark cloud hovering above... Beck is posing a number of unanswered questions that frankly, should be the focus of criticism. I notice you avoid the subjects of ethics, Obama's staff and their past radical activism, and other core positions that Beck takes. As I recall, he was not a fan of Bush or McCain. I'm not sure what election his side lost... I take that back. His side hasn't had a candidate for twenty five years. We'll see what the public says this fall! Hey Collin, thanks for dropping by. Let me respond to two points. 1) What cloud is hanging over the Administration? I would point to Afghanistan in light of the WikiLeak releases, but Beck hasn't mentioned the biggest story of the week, if not month. I would also discuss the deficit as a dark cloud, but until the economy turns around and tax revenues increase, there is not too much to do about it. Gut the demand side of the economy (social programs) and the recovery could stall. There is a move afoot to curb the "global reach," but there is a vested interest, many of them, for maintaining world-wide hegemony. So what dark cloud? I can't answer questions on behalf of the Administration although I have asked for that assignment. You mean to tell me that there hasn't been a Libertarian candidate for President "for twenty five years?" Was Ron Paul not reactionary enough? Protecting the public interest does not either curb personal liberty or doom the economy. You listen to Beck too much. Corey, I missed this as the comment was initially cleared, but in hindsight I have come to understand that you're pointing to another example of hypocrisy.